A pilot survey of junior doctors’ attitudes and awareness around medication review: time to change our educational approach? Objectives Our aim was to explore junior doctors’ attitudes and awareness around concepts related to medication review, in order to find ways to change the culture for reviewing, altering and stopping inappropriate or unnecessary medicines. Having already demonstrated the value of team working with senior doctors and pharmacists and the use of a medication review tool, we are now looking to engage first year clinicians and undergraduates in the process. Method An online survey about medication review was distributed among all 42 foundation year one (FY1) doctors at the Chelsea and Westminster Hospital NHS Foundation Trust in November 2014. Descriptive statistics were used for analysis. Results Twenty doctors completed the survey (48%). Of those, 17 believed that it was the pharmacist's duty to review medicines; and 15 of 20 stated the general practitioner (GP). Sixteen of 20 stated that they would consult a senior doctor first before stopping medication. Eighteen of 20 considered the GP and consultant to be responsible for alterations, rather than themselves. Sixteen of 20 respondents were not aware of the availability of a medication review tool. Seventeen of 20 felt that more support from senior staff would help them become involved with medication review. Conclusions Junior doctors report feeling uncomfortable altering mediations without consulting a senior first. They appear to be building confidence with prescribing in their first year but not about the medication review process or questioning the drugs already prescribed. Consideration should be given to what we have termed a ‘bottom-up’ educational approach to provide early experience of and change the culture around medication review, to include the education of undergraduate and foundation doctors and pharmacists. However, reviewing and stopping medicines do not appear to be part of the culture of routine practice and generally not part of the admitting (junior) doctor's process. 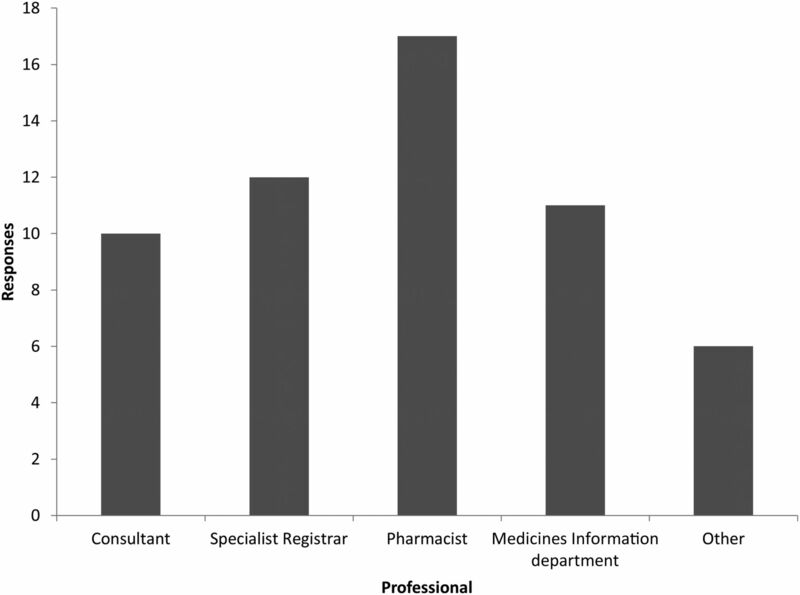 There is evidence that at the early stages of a medical career, doctors may not possess sufficient competence and confidence to perform a medication review,6 and may feel uncomfortable stopping medicines that more senior doctors have initiated; indicative perhaps of hierarchical dominance. Research is needed to explore the ability and attitudes of junior doctors in contributing to medication review, as well as their awareness of medication review tools that have been developed to aid them in this process. This will allow us to identify barriers to the contribution of FY1 doctors to managing medicines in the acute setting, where they are regular prescribers if not ‘deprescribers’. To elicit junior doctors’ attitudes to and awareness of the need to review medicines in elderly patients. To explore factors that may hinder medication review and deprescribing. To use this information to formulate a ‘bottom-up’ approach to educate foundation and undergraduate doctors and pharmacists in preparation for their roles in medication review. Ethics approval was sought from CWFT Research and Development and National Research Ethics Service (NRES) but was deemed not required as this was a service evaluation. Our study comprised an online questionnaire survey that investigated the attitudes of all CWFT FY1 doctors to concepts around medication review and their familiarity with medication review tools. The survey was phrased to avoid confusion between ‘medication review’ and ‘medicines reconciliation’. 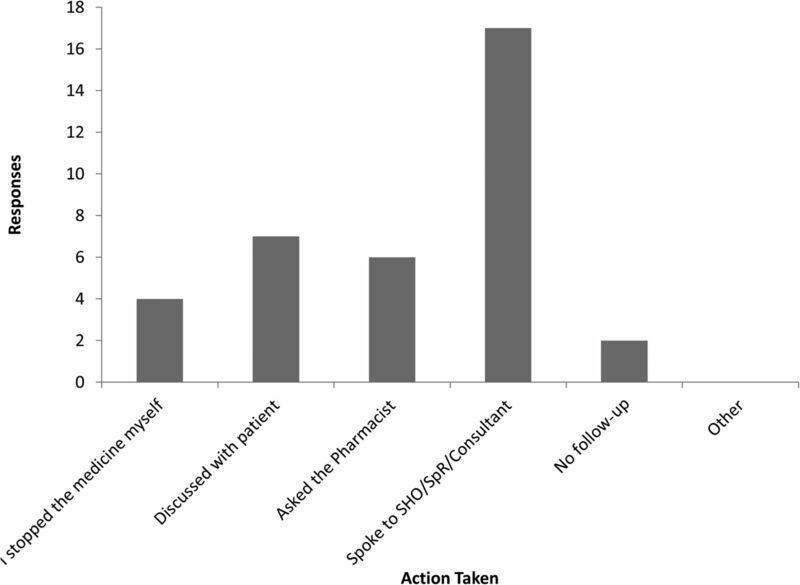 A focus group of two senior CWFT/CLAHRC pharmacists, a consultant geriatrician, two FY1 doctors and an undergraduate pharmacy student used the action–effect diagram to identify survey themes. Thirteen questions were derived from the focus group themes, and circulated among the group for further comments before piloting in October 2014. The survey was designed in the online survey tool SurveyMonkey; where a question offered an ‘other’ response to tick, with a free text box provided to allow for any additional comments. Descriptive statistics were used for frequency of responses and where appropriate cross-tabulations were applied. Given the sample size, no inferential statistics were applied, with a focus given to qualitative aspects to highlight areas in which training interventions can be made. The results for this are broken down by theme: specialty of the FY1, medication review, medication review tools, feelings around prescribing and stopping medication and what would help. Between 28 October 2014 and 21 November 2014, 12 online responses were received. Using PDSA methodology, the team gathered at a CWFT weekly junior doctor training session on 21 November 2014 and distributed paper copies of the survey which yielded a further eight responses. The survey was closed on 23 November 2014, with a response rate of 20/42 FY1 doctors (48%). Eleven of 20 (55%) respondents were working in medicine, six in surgery (30%) and three (15%) in acute medicine. Table 1 states the self-reported frequency of medication review undertaken by FY1 doctors on their elderly patients. ‘Other’ (free text) responses included (frequency in brackets): once per admission (2), when the patient has a prolonged stay (1), if asked by a consultant/pharmacy/need something new (1) and every 2–3 days (1). The opinions of FY1 doctors on who reviews and stops medication are shown in tables 2 and 3, respectively. Reviewing elderly patient's medication is mostly commonly thought to be carried out by the pharmacist, followed by general practitioner (GP), specialist registrar (SpR) and consultant. All three ‘other’ responses in table 2 stated the FY1 doctor. The majority of participants chose GP and consultant for being the professionals they believe are responsible for stopping elderly patient's medication. The SpR was the next most popular option, followed by senior house officer (SHO), FY1 and pharmacist. Within their current specialty, most FY1 doctors reported stopping medications weekly (11), with no respondents reporting ‘never’. Outside their specialty; however, FY1s reported either never stopping medicines (7) or only do so monthly (6). 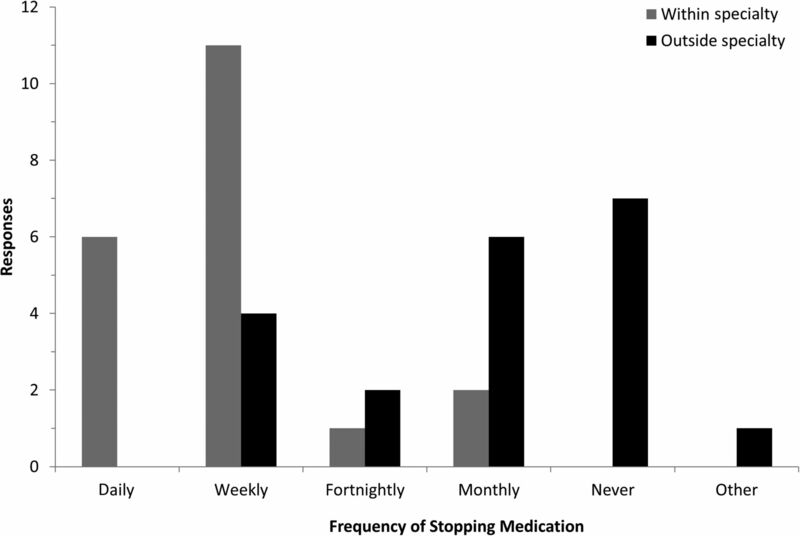 No FY1s reported stopping medications daily (figure 1). Responses to ‘with what frequency do you stop medicines?’ within and outside the specialty to which currently attached. Sixteen out of 20 FY1 doctors reported having never heard of a medication review tool. Three of the remaining four doctors stated having heard of the STOPIT tool (see the Introduction) and one had heard of STOPP/START.13 When questioned if the FY1s had ever used the selected tool in clinical practice, only one respondent stated yes. Sixteen out of 20 FY1 doctors reported feeling comfortable prescribing within their current specialty. The same number of doctors also stated feeling uncomfortable stopping or starting a medication without speaking to a senior first. No respondent reported feeling ‘very uncomfortable’ prescribing within their specialty; however, 10 FY1 doctors reported feeling uncomfortable with prescribing medication outside of their current specialty. Eighteen out of 20 FY1s stated having questioned the suitability of a medicine for an elderly patient; the others reporting that they had not done this. After questioning the medication, the FY1s working in medicine (following analysis by speciality) were more likely to speak to their SHO/SpR/consultant (figure 2). For those answering ‘yes’ (18/20) to ‘have you questioned in your mind whether a medicine for one of your elderly patients is necessary?’ This chart shows the responses to ‘what did you do about it?’ SHO, senior house officer; SpR, specialist registrar. Seventeen out of 20 respondents would approach a pharmacist if they did not recognise a medication prescribed for their elderly patient. This was followed by registrars (12 responses). ‘Other’ responses included (frequency in brackets): British National Formulary (4) and Foundation Year Two doctors (2) (figure 3). Responses to ‘who would you ask if you see a medication prescribed for your elderly patient that you don't recognise?’ (multiple options permitted). What would help with confidence in medication review? When asked what would help FY1 doctors become more confident in making suggestions to review/stop medicines, 17/20 participants chose ‘support from senior doctors’, followed by 10/20 selecting ‘my team being more open to medication review’. Nine out of 20 equally stated that support from pharmacists and a medication review tool would be of help. Finally, 7/20 reported that more teaching on the subject in the medical school syllabus would help improve their confidence in stopping and reviewing medicines. There may be a number of reasons why FY1 doctors may not perform routine, complete medication reviews. It could be that they lack familiarity with the concept or definition of medication review,1 or confidence in using medication review tools. We have also discussed locally the expectations around whether a medication review is required. For example, local focus groups suggested that indications for medicines are frequently not known to the admitting team, medication lists may not be up to date, and surgical teams may be reluctant to change medications.9 These factors may give the message to junior doctors that a medication review is not needed or is impractical. Moreover, junior doctors may lack the required competence in evaluating medication across a range of multimorbidities in older people. It may also be that senior staff, when undertaking medication review, do not do it in the presence of the junior doctors and/or do not share their methodology or rationale, making the process of structured medication review invisible to junior doctors and preventing learning. These factors could conspire so as to reduce opportunities to gain experience, and with past events guiding future behaviours.14 This may impact the capability to perform such review tasks. In addition, FY1s may believe that medication review is the responsibility of more senior staff and thus they do not need to be involved, or have a reluctance to review and optimise (including appropriate deprescribing) what senior doctors, including GPs, have previously prescribed. In this respect, we consider that hierarchical dominance is a theme worthy of further exploration. The aviation industry suffered a number of catastrophic events that led to changes whereby hierarchy is maintained; but a less authoritarian stance is sought to make optimum use of all available resources, including people, to promote safety and efficiency.15 This provides a supportive learning opportunity within a multidisciplinary team to gain experience. This approach, through a number of iterations, has been used within the healthcare settings.16–18 As we apply these principles, we propose that a ‘bottom-up’ approach to medication review may begin the change of culture and acquisition of experience that engages doctors and pharmacists at the undergraduate and foundation levels in the medication review process. Seven out of 20 of our FY1 respondents supported the introduction of relevant undergraduate education. Although our survey is not validated and this study is exploratory in nature, the purpose was to begin to elucidate our FY1 doctors’ attitudes to and awareness around specific questions relating to the concept of medication review. For example, one question was ‘Have you questioned in your mind whether a medicine for one of your elderly patients is necessary?’ Little literature, if any, elucidates the views of junior doctors around concepts related to medication review. This FY1 survey begins to explore this and we plan to repeat the medication review survey for all FY1 doctors in London, given the generalisability of our work and the need to ensure that non-responder and social desirability bias are properly evaluated. The survey results are useful as we consider the education of pharmacists and doctors at CWFT. Moreover, through discussion of the findings of our projects within NIHR CLAHRC NWL and with our junior doctors, we are in 2015 seeking to launch a ‘bottom-up’ approach to engaging doctors and pharmacists in the medication review process in all settings, including acute care. We hope to influence undergraduate and foundation education for doctors and pharmacists in London and possibly beyond, a concept that has recently been supported outside Europe.19 Our approach is firmly based on the principle that appropriate medication review must be based on adequate medicines reconciliation (V Marvin et al, unpublished data, April 2015), and our local work supports the notion that interdisciplinary medication review is an ideal way to review medication.9 We also believe that the use of medication review tools can equip junior doctors and pharmacists to participate in the review process by prompting senior clinicians in the acute setting and after discharge from hospital. This may support GPs in managing their primary care patients with clear, concise and complete information about medication review undertaken during a hospital admission. We are acutely aware of the need to ensure and teach novice practitioners not to deprescribe indiscriminately, but prompt their seniors for support, having identified possible medicines to review. Educating undergraduate and foundation doctors and pharmacists will also prepare them for their responsibilities as seniors around appropriate prescribing and deprescribing, not least through gaining experience. To this end, we have begun to influence the undergraduate curriculum in one pharmacy school by running final year medication review case studies, and are suggesting medication review-related learning outcomes for the London-wide and national foundation curricula for pharmacists. Our next steps are to emulate this activity for medical schools and foundation doctor training. We encourage our European colleagues to explore the ability of and any barriers to junior doctors and pharmacists to contribute to the medication review process in the acute setting, and to ensure that they understand the imperative of adequate medicines reconciliation, where appropriate for their health system, before undertaking a medication review. Much research and opinion-based literature around appropriate prescribing, ‘deprescribing’ and medication review is being published; but most is aimed at senior doctors and pharmacists. Little has been published about the views and awareness of medication review among junior doctors, pharmacists and students. Our motivation for undertaking this pilot study was based on work in Northwest London (NWL) to embed a culture of medication review and concomitantly identify the need to influence undergraduate and newly qualified doctors and pharmacists. We present here a pilot study of junior doctors’ views on and awareness of concepts around medication review in one UK hospital. Our survey has led to a suggested ‘bottom-up’ approach to education about medication review, which we believe to be the first of its kind and is being developed currently in London. The authors would like to thank Dr Muhammad Umer and Dr Sarah-Jane Trehane (FY1 doctors) for helping prepare and distribute the survey at CWFT. We are also grateful to the FY1 doctors at CWFT who completed the survey for us. Publishing costs are supported by Imperial College London Central Library. Department of Health Publications, Policy and Guidance. http://webarchive.nationalarchives.gov.uk/+/www.dh.gov.uk/en/publicationsandstatistics/publications/publicationspolicyandguidance/browsable/dh_5354376 (accessed 7 Apr 15). Royal Pharmaceutical Society: Professional Standards for Hospital pharmacy Services: Optimising Patient outcomes from Medicines v 2 July 2014. http://www.rpharms.com/unsecure-support-resources/professional-standards-for-hospital-pharmacy.asp? (accessed 7 Apr 15).
. The improving prescribing for the elderly project (ImPE, NIHR CLAHRC NWL). The Health Foundation, 2013.
. Intermediate care: an optimal setting for review of inappropriate medication in elderly patients? Geriatr Med (http://www.gmjournal.co.uk) 2014;44:13–17.
. A survey exploring junior doctors’ attitudes to medication review [abstract in press]. Poster presentation at Prescribing and Research in Medicines Management (UK & Ireland) (PRIMM) Conference; London, 2015. Disclaimer This article presents independent research commissioned by the National Institute for Health Research (NIHR) under the Collaborations for Leadership in Applied Health Research and Care (CLAHRC) programme for Northwest London (NWL). The views expressed in this publication are those of the author(s) and not necessarily those of the NHS, the NIHR or the Department of Health. Ethics approval Chelsea and Westminster Hospital Research and Development. Data sharing statement All the data collected via SurveyMonkey are available to the coauthors via a login that is held by NIHR CLAHRC NWL.